Great Value Wall Mounted Reel! 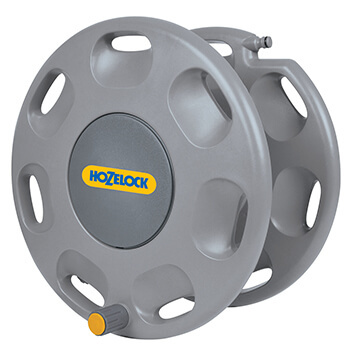 The Hozelock wall mounted reel is a thru flow reel deisgned specifically for wall mounting and is supplied complete with wall bracket and all fixings. The universal hose guide allows the hose to be pulled out at any angle to the wall and can be mounted flat or on the corner of a building. The reel can be purchased empty or one of the following 12.5mm diameter hose can be selected. Hold up to 60m of hose! The Hozelock wall mounted reel is a through-flow reel designed specifically for wall mounting and is supplied complete with wall bracket and all fixings. The universal hose guide allows the hose to be pulled out at any angle to the wall and can be mounted flat or on the corner of a building. 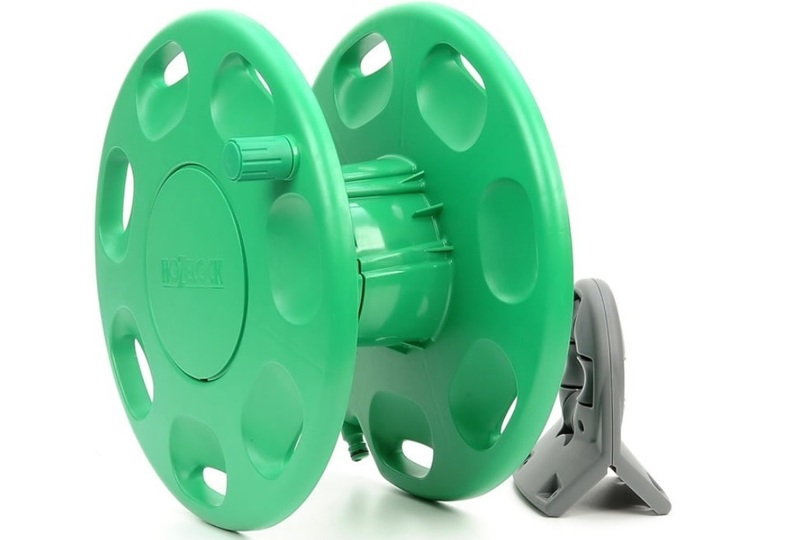 The reel will hold upto 60m of standard 12.5mm (1/2 inch) hose and includes a hose end connector (2166) and a hose repair connector (2100). The reel can be used with any 12.5mm diameter hose. 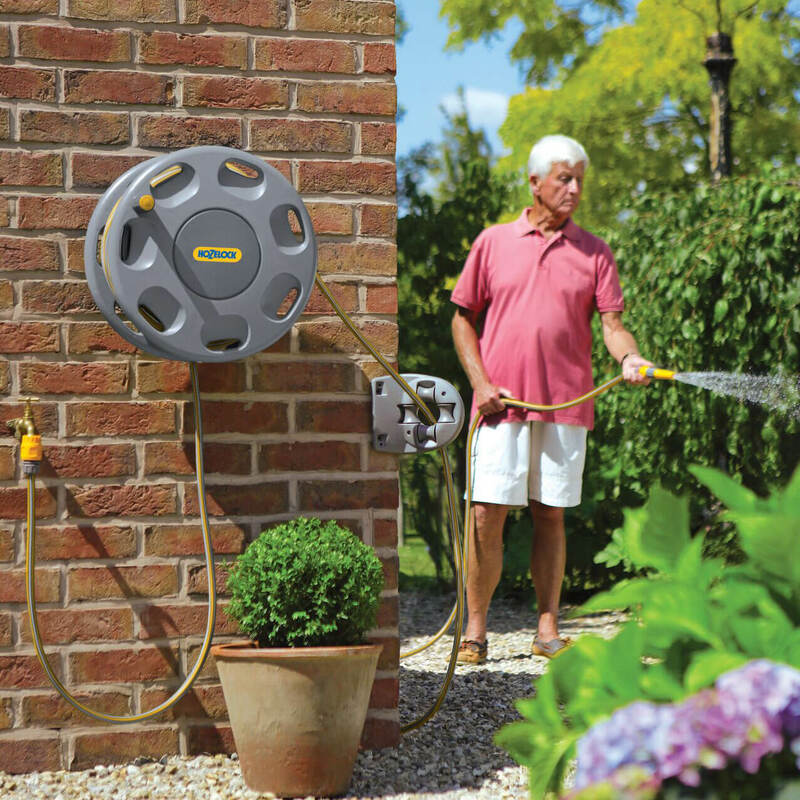 Hozelock offers a range of garden hoses to suit different needs. View the whole range of hoses here! Multi purpose: A durable, lightweight reinforced hose with a translucent green outer, suitable for most garden applications. Available in 15, 30 and 50m coils. Professional: An extra-thick, reinforced, crush-resistant hose that is designed for high strength and long life. Choose professional for heavy-duty applications. Available in 25 or 50m coils. Ultraflex: A superior specification hose with a specially designed reinforcing layer that virtually eliminates twists & kinks. Lightweight and easy to manage, this hose is suitable for general garden use. Available in 30 or 50m coils. 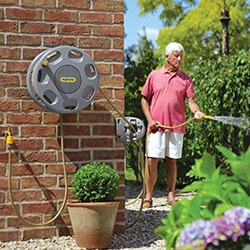 Ultra Pro: is a premium 5 layer hose pipe. This hose has a smooth inner layer, knitted reinforcement and a UV resistant outer layer. Ultra Pro is Anti Kink and Anti Crush.